While North Korea has not yet tested an intercontinental ballistic missile (ICBM), the pace of missile testing under Kim Jong-un indicates steady progress. Yet the continental United States has missile defense systems in place, so there’s nothing for Americans on the mainland to worry about, right? Well, not quite. The only system capable of defending the United States from an ICBM attack is the Ground-Based Midcourse Defense (GMD) system, which was successfully tested Tuesday. The test, featuring a new and improved kill vehicle, was the first intercept test since 2014 and the first one involving a target missile that simulated an ICBM. However, it would be unwise for policymakers or the American people to assume that the GMD could reliably defend the U.S. homeland from a North Korean ICBM. While Tuesday’s test was more realistic than previous ones, it was still tightly controlled and predictable compared to a wartime use of an ICBM by North Korea. Moreover, expanding the quantity and quality of U.S. homeland missile defense systems could prompt negative countermoves by other nuclear powers. Three important technical caveats should curb the enthusiasm of missile defense advocates. First, the target missile barely qualified as an ICBM. Such missiles have a minimum range of 5,500 km. According to a pre-test analysis by Laura Grego at the Union of Concerned Scientists, the target missile used in the test had a range of approximately 5,800 km. Any North Korean ICBM would have to fly much farther than 5,800 km to reach U.S. territory, which means a faster burnout speed for the missile. A North Korean ICBM headed for Hawaii or the mainland United States would be moving faster than the target missile used in Tuesday’s test, which makes a successful intercept more difficult. Second, the kill vehicle tested Tuesday is not widely deployed across the GMD system. Two kill vehicles are currently deployed across the system in large numbers, the CE-I and the CE-II. Neither of these models has been tested against an ICBM target, and both have low success rates in intercept testing. The kill vehicle used in yesterday’s test, the CE-II Block 1, is not yet deployed on the GMD fleet. According to a recent report by the Center for Strategic and International Studies, by the end of 2017 there should be eight CE-II Block 1 kill vehicles out of 44 total. Finally, the test was scripted and far less complicated than a North Korean wartime ICBM launch would be. 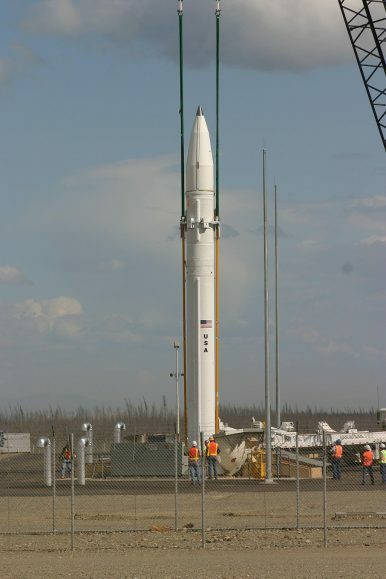 The launch point of the target ICBM was also known in advance of the test, which makes it easier to intercept. In an actual conflict it is highly unlikely that the North Korean ICBM launch point would be known in advance, especially since all of North Korea’s ballistic missiles are mobile. Homeland missile defense advocates will likely use the successful test to push for the continued development and expansion of the GMD, despite its limited track record of success and high cost. Senator Dan Sullivan from Alaska praised the test on Facebook, saying “we need to do more to ensure that our missile defense system continues to advance ahead of the rapidly increasing North Korean threat.” On May 22, Sullivan and several other senators introduced the Advancing America’s Missile Defense Act of 2017, which would add 28 GMD interceptors and accelerate environmental impact statements for additional interceptor sites. Some experts have called for expanding the number of GMD interceptors even further. A Defense News article by Thomas Karako and Ian Williams argued that at current rates of production there could be 80 interceptors deployed by 2020. Expanding homeland missile defense may bolster deterrence against North Korea, but it could also lead to negative consequences for strategic stability with other countries, especially China. In order for nuclear deterrence to be credible, countries have to be confident in the ability of nuclear weapons to reach their target. Increasing the quality or quantity of U.S. homeland missile defense reduces the chance that nuclear weapons can hit the United States. Therefore, China will face pressure to counteract U.S. missile defense developments to preserve confidence in their own deterrent. The recent success of the GMD system seems like an impressive feat on the surface, but the caveats and consequences of its success should give policymakers and the American people pause. The test does not prove that the GMD would succeed in defending against a North Korean ICBM attack. Furthermore, using the test as a rationale for expanding U.S. homeland missile defense could carry negative long-term consequences. Missile defense systems shouldn’t lull anyone into a false sense of security. Can the US Defend Against a North Korean ICBM? Shooting down an ICBM is an incredibly difficult task. Are U.S. missile defenses up to the challenge?